After a relaxing week of Spring Break and a few days at Disney World I am back to work and reality this week. And reality means needing groceries. 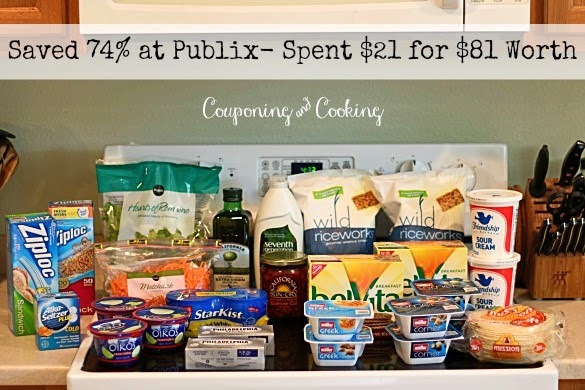 So I hit up Publix on Tuesday to grab a few things we were low on (clearly yogurt) and a few super deals to hold us off until I shop the new ad this weekend. I was a little disorganized this week so I probably missed out a few good deals due to the fact that I just couldn't get all my coupons together. My store was also out of a couple of the super deals so I had to skip them. I used my two $5/$30 Winn Dixie coupons as usual which really helped bring my total down. I had gift cards from blog promos for the whole total out of pocket so I was happy not to need any of my weekly grocery cash budget. I have a HUGE list for this weekend so hopefully everything lines up right and I can get it all. How did you do this week? Comment with your best deals or leave a link to your shopping posts!